Take control of your investments with Cornell Capital Management. There are no limits. Education brings opportunity. Expand your knowledge with Cornell Capital Management. Cornell Capital Management offers comprehensive financial solutions to individuals and corporations on a worldwide basis. 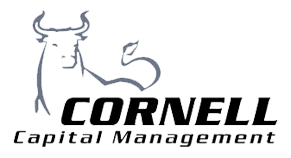 From growing your wealth to planning for your employees future, Cornell Capital Management is New York's preeminent investment advisor. Whether you are a party of one or a corporate pension fund of one thousand, Cornell Capital Management can help you and your team achieve your financial goals. We Offer Investment Portfolios to Match Your Needs. One-size fits all is best left to vacation bike helmets. At Cornell Capital Management, we specialize in designing client-specific investment portfolios to not only fit your current situation, but also provide a solid foundation for future growth. No matter where you are in your financial journey, we endeavor to take you to the next level. The laws, regulations and statutes that govern how and where you can invest your money change constantly. Let us keep you on the cutting edge of financial planning. No matter where you are in the world, Cornell Capital Management provides discrete, professional Wealth Management services. Hartzell Long/Short, one of the top performing hedge funds since its inception, is available anywhere in the free world. MEET OUR PRESIDENT AND CEO. Our experienced and enthusiastic team thrives on client satisfaction. Please visit our team page to learn more about our President and CEO. INDIVIDUALS & CORPORATE FINANCIAL SOLUTIONS. Whether you’re a party of one or a corporate pension plan of one thousand, Cornell Capital Management customizes your investment strategies to fit your current needs and future goals.